Jennifer Cluff: Flute tone videos on Youtube helped! Flute tone videos on Youtube helped! I just wanted to thank you for the wonderful teaching videos you so kindly posted online. Here's the story: I'm 30 years old, and learned flute for a number of years when I was a kid. I was always musical, but was frustrated with the flute because I found the embouchure and tone hard and never sounded particularly nice, and just assumed I was incapable of doing anything about this. As a result of this, I barely picked up my flute in the last ten years. In the meantime I gravitated towards recorder (which I still play and love), played it fairly seriously at university, and in the end fell in love with research and became an academic in ethnomusicology. As part of my academic work, I demonstrate certain pieces. I usually play recorder, but sometimes certain pieces don't fit so well on the recorder because of the limited range. A couple of weeks ago I was listening to a recording of a flute, and thought, 'oh, why not play flute for the teaching?' I experimented with flutes and bought a nice TJ Cantabile model from a specialist flute store here in London which is very gratifying to play compared to the beginners' flutes, and I liked the way it didn't try to force a thin, over-pure sound like some of the others I tried. I decided to practice a bit before I go to a teacher, just so I'd have un-rusted my fingers and will have something to play. I found myself getting very tired and still a bit frustrated. Then last night I found your videos, and watched, literally without looking at the time once, until past midnight. I couldn't believe my eyes - because in all those years of frustrating flute lessons, nobody had EVER told me the most basic things about tone production - where to place the flute, that the lips shouldn't be tense, that the flute shouldn't be jammed into the lip, and about long notes for tone practice. This morning, sure enough, I sat down and played beautiful B naturals for half an hour, then simply whizzed around the three octaves with a nice tone and no effort whatsoever. Anyway, obviously I'm just getting back into things and have much practice to do. 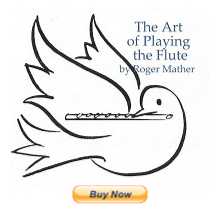 But I just wanted to thank you so much for these really helpful practical tips - and above all, for helping me to find that playing the flute can actually be gratifying and sound nice, even when played by me! Thank you SO much for sharing these fabulous materials. A, you are absolutely correct! Oh goodness...so many, and really, I couldn't live without them. Haha! Please, whatever you do, DON'T change 'Big number 2' to 'Rehearsal number 2'...at least not when I'm around. It's a special Jen-ism. :D Hahahaa! !